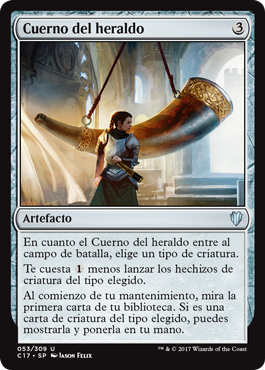 It’s day two of spoiler week for Commander (2017 Edition). 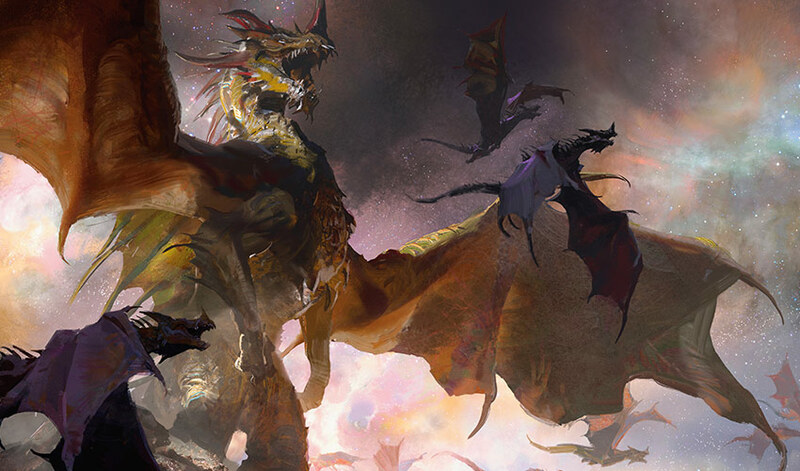 Today, we get our first official look at the dragons of C17, plus a few bonuses. 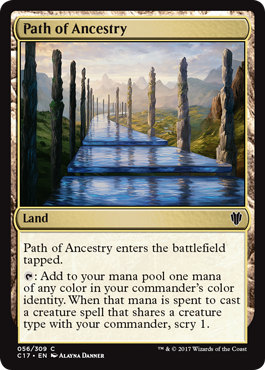 Perhaps the most notable spoiler today is Path of Ancestry, which is an easy auto-include in all tribal commander decks moving forward. 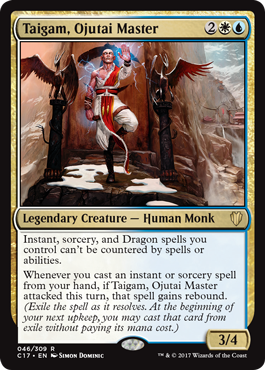 With the amount of hype around tribal commanders, we could certainly see this card becoming one of the more desired singles moving forward. 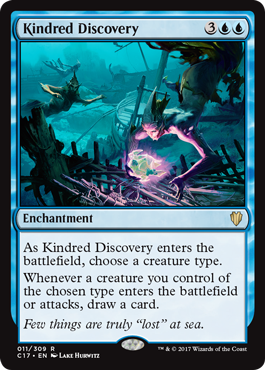 Another card to pay particular attention to is Kindred Discovery, which can provide any tribal commander running blue an explosive mid-to-late-game if it goes unanswered. Even on the turn it comes out, expect its caster to draw 2-3 cards from the attack trigger. Kindred Discovery is a great addition to blue/black zombie strategies, slivers and more. 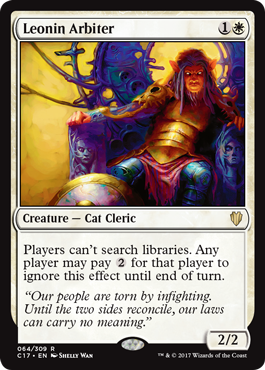 Finally, we also see a welcome reprint of Leonin Arbiter, further pointing to C17’s cat tribal deck as featuring at least some level of pillow-fort strategy. The Arbiter is not a particularly expensive card, but it’s nice to see its inclusion here to help keep the price from creeping up. 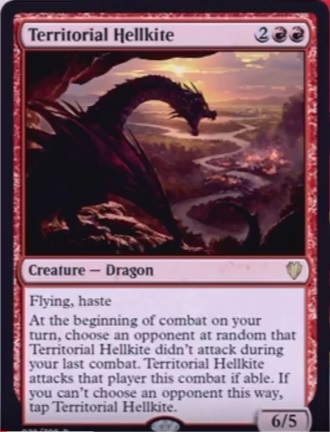 Oh, and did I forget to mention that after over a decade, we finally get to see The Ur-Dragon? And he’s 10/10. 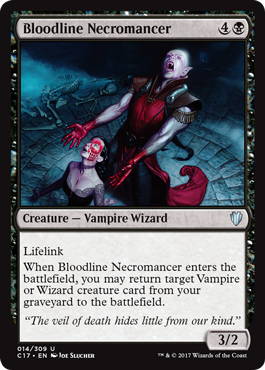 When ~ enters the battlefield, you may return target Vampire or Wizard creature card from your graveyard to the battlefield. When ~ enters the battlefield, choose a creature type. At the beginning of your upkeep, you may look at the top card of your library. If it’s a creature card of the chosen type, you may reveal it and put it into your hand. As ~ enters the battlefield, choose a creature type. Flavor text: Few things are truly “lost” at easy. Players can’t search libraries. Any player may pay 2 for that player to ignore this effect until end of turn. Whenever ~ deals combat damage to a player, if that player attacked you during his or her last turn, exile target nonland permanent that player controls. 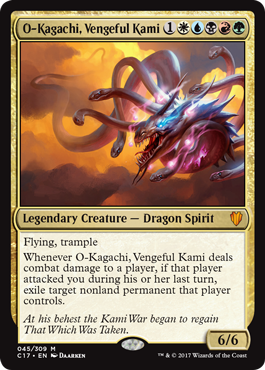 Flavor text: At his behest the Kami War began to regain That Which Was Taken. T: Add to your mana pool one mana of any color in your commander’s color identity. When that mana is spent to cast a creature spell that shares a creature type with your commander, scry 1. 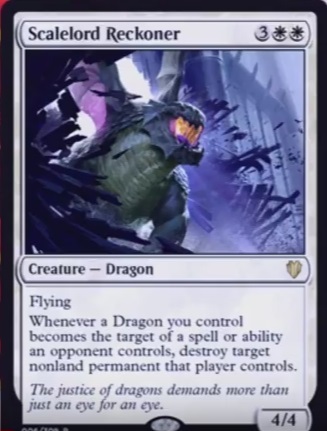 Whenever a Dragon you control becomes the target of a spell or ability an opponent controls, destroy target nonland permanent that player controls. Flavor text: The justice of dragons demands more than just an eye for an eye. 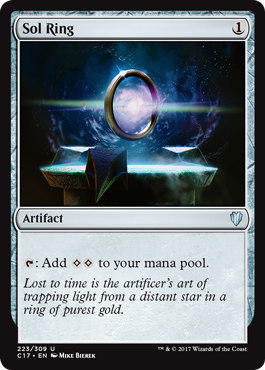 Flavor text: Lost to time is the artificer’s art of trapping light from a distant star in a ring of purest gold. At the beginning of combat on your turn, choose an opponent at random that ~ didn’t attack during your last combat. 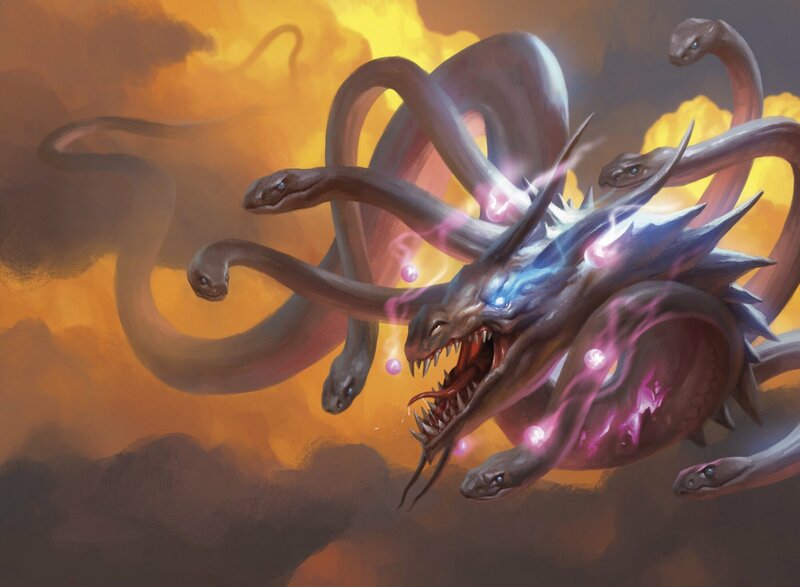 ~ attacks that player this combat if able. If you can’t choose an opponent this way, tap ~. 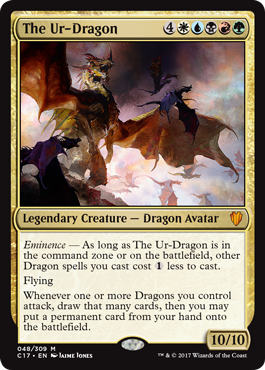 Eminence – As long as ~ is in the command zone or on the battlefield, other Dragon spells you cast cost 1 less to cast. Whenever ~ deals combat damage to a player, that player sacrifices a creature. 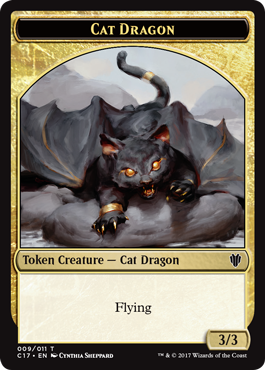 If the player can’t, you create a 3/3 black, red, and green Cat Dragon creature token with flying. Flavor text: Once a fierce foe, she would become one of Madara’s greatest protectors. 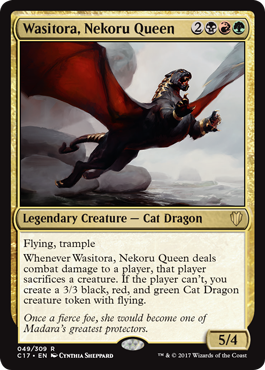 Looks like spoilers weren’t done for the day, and we’ve been given a second round, including a whole slew of new Dragons. Check them out below! Whenever a Dragon you control dies while ~ is in your graveyard, you may pay 1B. If you do, return ~ from your graveyard to the battlefield. 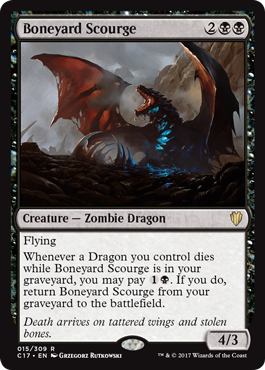 Flavor text: Death arrives in tattered wings and stolen bones. 1, T: Put a storage counter on ~. 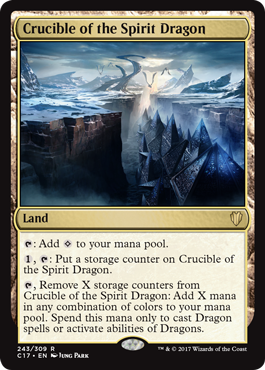 T, Remove X storage counters from ~: Add X mana in any combination of colors to your mana pool. 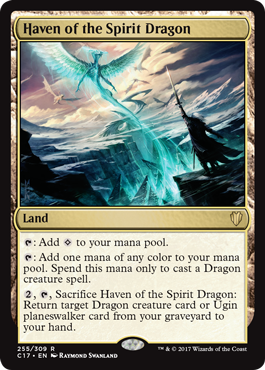 Spend this mana only to cast Dragons pells or activate abilities of Dragons. * Destroy all Dragon creatures. * Destroy all non-Dragon creatures. 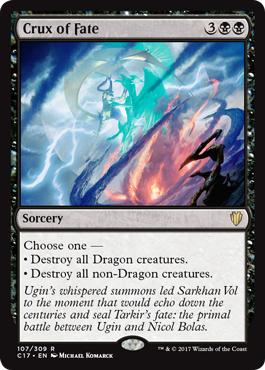 Flavor text: Ugin’s whispered summons led Sarkhan Vol to the moment that would echo down the centuries and seal Tarkir’s fate: the primal battle between Ugin and NIcol Bolas. 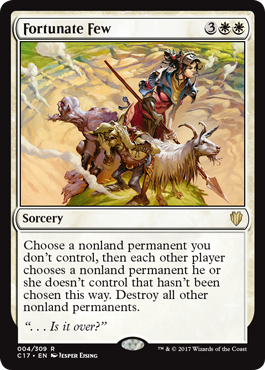 Choose a nonland permanent you don’t control, then each other player chooses a nonland permanent he or she doesn’t control that hasn’t been chosen this way. Destroy all other nonland permanents. T: Add one mana of any color to your mana pool. SPend this mana only to cast a Dragon creature spell. 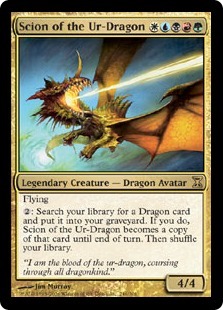 2, T, Sacrifice ~: Return target Dragon creature card or Ugin planeswalker card from your graveyard to your hand. Whenever you cast a spell, put a +1/+1 counter on ~ for each of that spell’s colors. Remove five +1/+1 counters from ~: Add WWUUBBRRGG to your mana pool. Activate this ability only once each turn. 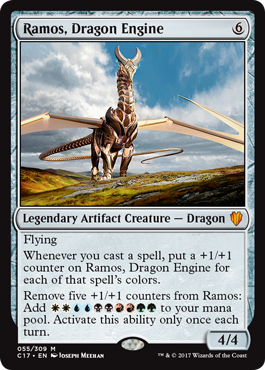 Whenever ~ or another Dragon enters the battlefield under your control, it deals X damage to target creature or player, where X is the number of Dragons you control. Exile target nonland permanent. Each player other than its controller creates a token that’s a copy of it. 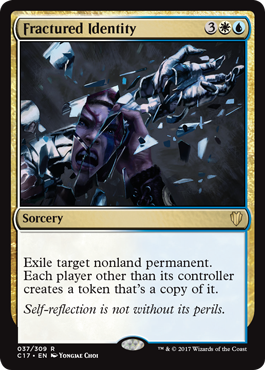 Flavor text: Self-reflection is not without its perils. 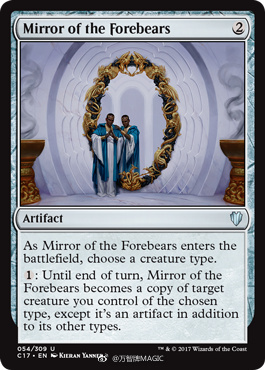 1: Until end of turn, ~ becomes a copy of target creature you control of the chosen type, except it’s an artifact in addition to its other types. 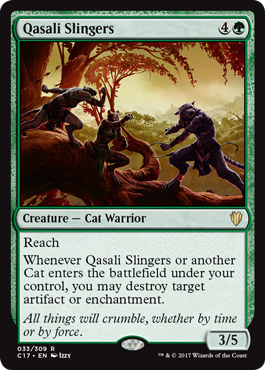 Whenever ~ or another Cat enters the battlefield under your control, you may destroy target artifact or enchantment. Flavor text: All things will crumble, whether by time or by force.